This is *so* interesting. The "Thumbport" people have created a new kind of left hand index finger support. This looks like a different version of a left hand "bo-pep". If anyone reading this blog has tried one, send your reviews. Are there improvements over the standard LH Bo-pep? I'm still using pencil grips stuck on with blue-tac. Send feedback on this new LH support dudes. Interesting. I've been having a bit of problems with pain on my left index finger while playing. So you use pencil grips and sticky-tac you say? Yes, I show them on my youtube video at "fluteloophost" on youtube. Slit the pencil grip open with scissiors, and apply it to the flute with blue-tac used for posters-on-walls. 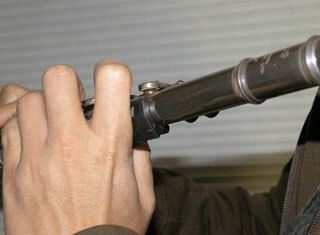 NO marks, no slippage, and as a result, no pressure needed to keep flute on index finger. I've bought it today and have the Bo Pep shipping, so should be able to give you some comparison later. I've tried to put it in different positions and different angles, trying to locate the best fit for my left hand. I would say that the range of position possible is limited. I have yet to give it a long enough test to see if it can relief the tension in my hand. Yes, I've read your article. Some thirty years ago I've played a few open-holes Chinese bamboo flutes of different keys and in that age, it is not difficult to adjust my fingers to cover the holes, even though they are in odd positions. However, as I have stopped playing, some how I've lost that abilities. Now I'm re-picking up the flute and have bought an open-hole model. My plan is to play it open-holed for some time so that I could get into the habit of placing my fingers at the centre of the keys. The open hole can remind me where the finger is placing. I also like the vibration feelings. I have spend 15 minutes to adjust the position of index finger thumbport, only after that I realized there were many possible posture I could play the flute. I sticked to that position and play for two days, then readjust it and find a better position. May be I have to refine the position again in the following days. After reading many of the articles in your blog and also with that adjustment experience I now understand the importance of correct hand posture. *Every* flute player should check it. Your site is wonderful, it is loaded with tons of useful information that I could not express enough appreciation to you. Thank you for helping me (and many others) to enjoy playing the flute! P.S. I would like to take some pictures of the thumbport, how could I send them to you? Dear 32T, thanks for your input. You can put pictures online and then send me a link. Try picasa web-albums or other free service. Firstly, Thank you for all your fantastic tips and advice - I can't get enough of your blog/website. I haven't tried the thumbport left finger support (but I love the right thumb one), and found that pencil grip was very comfy but muffled my flute sound. Anyway, I would like to recommend the bg flute hand positionner (yes, spelt like that!). Two bits of grippy material placed on the flute at the left hand index finger and at the right thumb, just adds a bit of grip to the flute - and increases comfort significantly! Highly recommended, i can't live without these! Cheap as well. Check it out at www.bgfranckbichon.com. I love a lot of the other bg products as well (am slowly working my way through them). The headjoint cleaner is also good (but risk getting stuck in the headjoint!!) and the pad cleaners are great. The pull throughs are great - the microfibre material is very absorbent. Right, this is off-topic so I'll stop here. How long do the "positionners" last, do you think? Thanks for the link; interesting. Basically, if you stick them in the right place then they'll just stay there with no problems (forever! ), but if you keep repositioning them, then the stickiness wears off. (But you can reposition them several times with no residue left.) With my first set , it didn't last very long as I was constantly fiddling about to find a comfy position for myself . But the second set has stayed on for over 5 months with no sign of wear at all. Big smiles here. I'm Bo Pep (Bolek Peplowski) inventor of the original bopep. I'm smiling because I remember the resistance I encountered from the flute community when I first introduced the finger rest and finger saddle (we didn't call them bopeps - that was simply the name of the company, bopep, inc.). Interestingly, people like Wally Kujala of the Chicago Symphony, Jeannie Baxtresser, the Dysfunction Committee of the NFA and other top professionals saw its virtues immediately and long before flute teachers accepted it; teachers generally saw it as a gadget and were reluctant to test it. FYI: The composition of the material used for anything you attach to a metal flute is very important because most materials rob sound vibrations and act like mini-mufflers (not very important to students perhaps, but very important to professional players). I went through many different rubber/poly formulas before finding the optimum material for the finger rest - a material that actually brightened flutes and also because the soft finger tissue no longer touched the flute. Glues and adhesives also act as sound absorbers. There is more to that little bopep than meets the eye (or the finger). However, it is gratifying to see that others are experimenting with other materials and configurations. This comment is not a bopep product commercial. I have not been associated with the company since 1995 and receive no residuals from the company. I'm happy enough to have lived long enough to see that flutists now understand the value of widening the flute at the left hand index finger position and also the knowledge that I may have left something useful and lasting in my wake. I wish you endless joys in beautiful sounds. This is fascinating information and thankyou SO much for writing! I like the bopep finger saddle for comfort but find it really scratches the flute, even putting it on once has left considerable scratches. Does anyone have any solutions for this? I use the fingerport too but this would be a bit chunky for small hands. The fingerport creates a flat surface, which makes it extra stable. The bopep does make you feel more in touch with the flute and the sound but the shape and material of the fingerport are good for stability and surface of the flute. Sorry, but I've never heard of a solution for the scratches except having the technician polish them off (done rarely of course, since they only return, and you don't want to over-thin the silver). I wish they'd redesign the product so that it did not scratch. The thumbport is anti-scratch. Uses softer rubber for the side that touches the flute. Thanks for your site, Jen! It's been very helpful as I get back into flute playing after a hiatus. Re scratches, I don't know the bopeps and whether or not this would work for them, but I've got a thumbport. It wouldn't stay on my flute, so I came up with the idea of lining it with a small piece of very thin non skid shelf liner, about 1" wide and 1.5-2" long (between the flute and the thumbport). 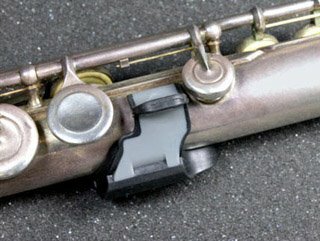 Keeps the thumbport on the flute really well and ensures that no scratching occurs. It does leave a bit of a residue, but that's easily cleaned off with my flute polishing cloth. And the residue stops after I've used the same piece for a few days (the existing residue comes off and no more is produced). To see the kind of shelf liner I use search Amazon Home & Kitchen dept for "Non-Skid Grip Shelf Liner Drawer and Cabinet Shelves Non-Slip Liner". HI Deanna, thanks for that tip. Good one. My thumbports fit and stay put; so your flute must be slightly smaller circumference. So far, no scratching whatsoever, and I've used them for ten years. I have seen the scratches from Bo-Peps, though. Thanks for the tip.